President Obama is absolutely right about this: If the Supreme Court rules the healthcare bill unconstitutional, it would be an overreach that would be an extreme example of judicial activism that violates the most core principles of what is called conservatism and, I would argue, would lead to a destructive historical break point in the history of the United States Supreme Court that would tarnish forever the reputation of the chief justice and the conservative majority of justices for centuries to come. Last week I wrote that never before in the history of the nation had a Supreme Court reversed the popular vote for president; never before in the history of the nation had a Supreme Court ordered a state, against its will, to stop counting popular votes, with the result determining the electoral vote count in a way that negates the popular decision of the people; and never before in the history of the nation had a Supreme Court so deformed democracy that it virtually legalizes the buying of elections by interests with huge amount of money that can dominate and destroy the will of the vast majority of the people of the nation. These actions by the court make a mockery of the time-honored notions of judicial precedent that the chief justice himself promised to uphold during his confirmation hearings. They make a mockery of the notion that courts should be impartial adjudicators of the law, not an aggressive intervener in partisan politics. They make a mockery of the core notion of the American idea that is under attack even without the intervention of the court, and under even greater attack because of it, that we are a nation of laws in which the people rule and not the factions that the Founders warned us against but which find such favor with the current court majority. J'accuse: The Supreme Court is on the brink of putting itself on trial in the eyes of the nation, and certainly with much of the nation that vehemently disagrees with the court's view that America is a nation in which the money rules over the people and that free speech is a property that can be bought by those who have the most money and thereby destroyed by those who do not. Chief Justice John Roberts is a brilliant and charming man, but he is a man with a hard ideological agenda who is taking the court in dangerous and in some important ways unprecedented directions. The chief justice might be a moderate and temperate man in a personal sense, but he is a conservative movement man who is taking the court in directions that help one political party over another in ways that violate core principles of judicial precedent, and core principles of conservative judicial philosophy that warn against judicial activism that the current court majority has taken to radical and extreme levels in decisions such as Citizens United. I find it ironic, outrageous and profoundly troubling that a Supreme Court majority of five men would join and at times lead an ideological attack on laws and programs that benefit women. This is unbecoming and unwise for a partisan party in the legislative and executive branches. It is radical, unprecedented and outside of American judicial tradition when a Supreme Court majority of five men wage an ideological crusade that places laws and programs benefiting women, by result if not design, under attack by the judicial branch while under attack by Republican partisans in Congress. It appears the court majority is determined to usurp and destroy traditional rights, prerogatives and responsibilities of the legislative and executive branches. 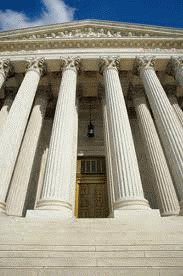 It appears that this court majority knows no such thing as the traditional judicial notion of avoiding political decisions; indeed, the court majority is increasingly dominating national elections and the justices act as though they are expert campaign managers while their decisions wreak havoc on the electoral process. What is next? Will the court majority overturn the Voting Rights Act? Will the majority endorse voter suppression using the same states'-rights argument it mocked in Bush v. Gore? Will the court next attack Medicare, Medicaid and insurance coverage for pre-existing conditions and overturn Roe v. Wade? Will every election in the coming decades be preceded by election-eve Supreme Court decisions in which factions using their fortunes to buy elections wins, and voting rights loses? My warning to the Supreme Court majority is this: Be careful. Stand down from extremism. Uphold the law but respect the prerogatives of the legislative branch, the executive branch and the people of the nation. Be warned: One more overreach and the Supreme Court will be on trial, in the eyes of the people the court serves and in the eyes of historians and future generations who will agree that the court should uphold the law but has become a partisan and ideological warrior fomenting another civil war.